This reminds me of those audio players from Windows 3.11 era. Is there any particular reason why should we care? I think as human beings we all want happy feelings most of the time, and yet every so often we experience something that really puts a dent in the hope for better days. We can't always control what goes on in our lives—though we might be able to control more than we think—and precious few of us have, as the serenity prayer goes, "the wisdom to know the difference". All we can do is pick up the pieces when something goes wrong, and learn its lessons. But despite that, you still posted this. Not bad, but the visualization and transport are too large while the playlist/lyrics fonts are too small, hope the UI can be customized. Browsers may be making that pic bigger than it is. It's very tiny. The control sizes are set like that for touch screens. Same for the meters (set size) since any smaller and may as well not have them (but you can remove them). It's a win10 app so it takes on whatever DPI its current monitor is set. The pic is from a standard 96 DPI monitor (100% scaling). Looks great on a 2560x1440 using 120 DPI. Direct2D is doing meters, and art, all the text outside of the windows controls (LV, buttons and sliders are regular windows controls). The pentagram with a baby inside it is an interesting choice for icon :p Apart from that has a kind of Winamp classic vibe going for it. He (Hugh Syme) is the guy waving in the album cover picture (at the top of this topic), over by the WALK sign. Probably. I doubt Winamp and this are similar. This is 64-bit only. It loads everything into memory. For example, an 80 min. FLAC CD is off disk and into memory in about 3 seconds (decoded to PCM, not just loaded). Most players will pull the disk for 80 minutes solid. Sounds excellent, too. Wonderful reverb. Crossfeed is essential for headphones, and it's pretty good there, too. Reverb and crossfeed can be tweaked. Tone, too (corner Hz, shelf slope, for left/right). EQ goes deeper, with control over each of the 8 channels for each band. No database. Loads and fully parses metadata at about 1000 files a second. Faster, even that that I think, but I don't usually load everything, just a few new CDs at a time. (I am doing only FLAC CDs from now on, and yes, full control is there; nothing lacking or wanting.) Typical playlists (m3u), but some smarts in how it finds the contents, and writes them for the FLAC CDs. But none of that is needed. Just pick a file or folder and go. Just a single EXE. About 3 MB (2MB of fonts in that). About 1 MB as an .msi. A single settings file, in plain text, per user. The Windows registry is not used. Everything is gapless. Except old MP3s with no markers, but FhG (VBR) is (even gets the right duration), LAME is, iTunes MP3s are. WMA? All are (even standard ones). M4A? All are. Well, if they (AAC) have that iTunSMPB thing (everything since iTunes v7 does). FLAC/ALAC are, of course. One correction: the very tiny pic is not from a 96 DPI display (was, but not now). It's from a 120 DPI display, so a bit bigger. One more nice pic to wrap up the year, and wrap up Jukebox 2112 (fork stuck). The hand-wave guy pic was replaced, but can still be found in the link at the top. This is the EQ. Only three days left in the poll. For those who see the coolness, the more at ... link at the top has the sneak peek zip to download. About 2 MB. Playable until mid-2017. Now you can hear the coolness. For the record - it's been a year since this poll started - Jukebox 2112 is now at version 5.12. Does it allow WASAPI or ASIO output (i.e., bit-perfect data streaming)? By screenshot(s), is this a jukebox program that only plays Rush? If so, it is a cool jukebox gag. That's yet another Rush thing. Just like the name of the media player itself. I won't say I expected someone to think that, but... I did. Here is the answer. Looks good, admire the programming skill here. Bit steap for my wallet but can totally understand wanting to be reimbursed properly for your work. Here is my opinion to that. -I don't see any stop button. Only play/pause. 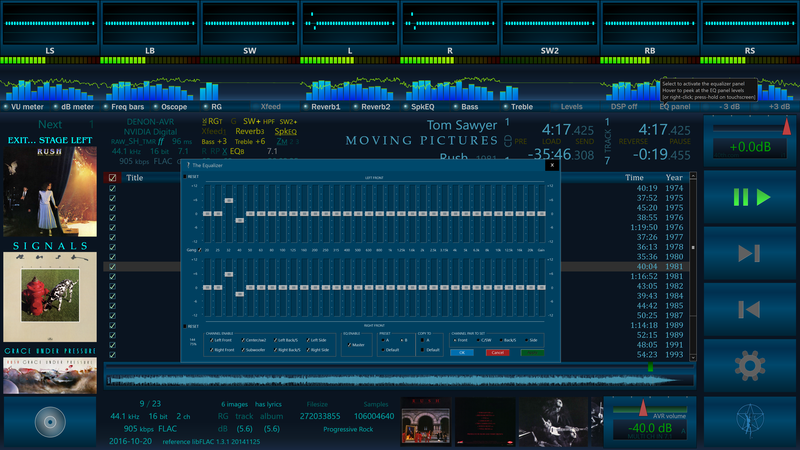 -Merge the separate channel visualisations to only one or two with the option to view them channel-wise, if someone is interested in (multichannel music is pretty rare, so most of time, many visualisation slots are grayed out and wasting space). -What are the buttons "+3dB" and "-3dB" for? If I would want to change the volume, I would use the volume slider instead for that. -I have no clue, what the button in the bottom-right corner does. It acually shows a pentragram with a dancing boy. 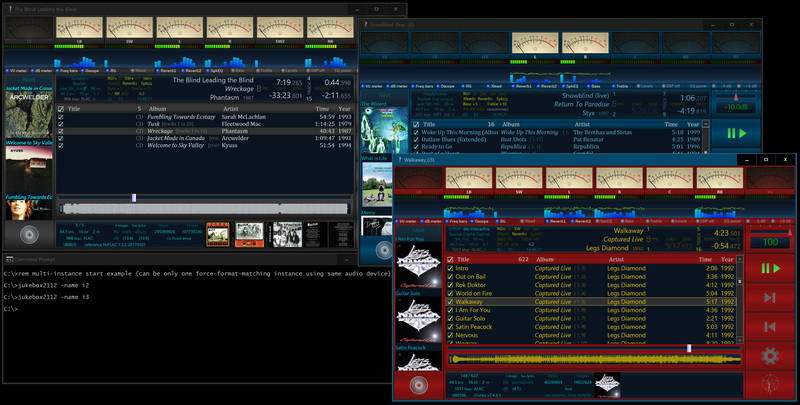 But the graphics looks still more appealing to me than most sterile "design" Flat-GUIs from modern music players. It is a standard titlebar. You haven't use it, have you? Going by the rest, it seems you haven't. But for one, yes, the meter response beyond 0dB is valid, and correct. Why that is true, I leave to the reader. To the previous guy, about price. There's soon to be a completely free version, so long as you only care to play mp3 tracks. Maybe this week, or next. You can get there by going to the Jukebox 2112 page, and add mp3.html after it. No, I judged by screen shot. That is actually that, what you've asked for. Beside your official offer for 26$, I didn't find any free testing version and I don't pay money for a very basic player that does not even support all common audio formats . Remember: You didn't list Opus as supported media format. The poll was from November 2016, and before anything was available. There is a free version available called mp3 jukebox. FTR, re: Reply #19 "free", not anymore.